1. The Promotion is run by Cancer Council Victoria (ABN 61 426 486 715 and CAN 608 530 972), trading as Cancer Council Victoria (‘Promoter’) of 615 St Kilda Road, Melbourne VIC 3004. 2. The Quit Victoria 2017 Submit Your Story (‘Promotion’) is a promotion that seeks to increase engagement with the Quit Victoria website and Facebook page. It seeks to encourage users to actively use the website and raise awareness on the harms of smoking. 3. Information on how to enter and the details of all prizes form part of these Terms and Conditions. Participation in this promotion is deemed acceptance of these Terms and Conditions. 4. Entry is only open to Victorian residents aged 18 years or older and via the Quit Facebook page only. 5. Employees (and their immediate families) of the Promoter and agencies associated with this promotion, are ineligible to enter. Immediate family means any of the following: spouse, ex-spouse, de-facto spouse, child or step-child (whether natural or by adoption), parent, step-parent, grandparent, step-grandparent, uncle, aunt, niece, nephew, brother, sister, step-brother, step-sister or first cousin. 6. The Promoter reserves the right, at any time, to verify the validity of entries and entrants (including an entrant’s identity, age and place of residence). In addition, the Promoter reserves the right to request the winner to provide proof of identity, age and proof of residency at the nominated prize delivery address. Identification considered suitable for verification is at the discretion of the Promoter. 7. The Promoter reserves the right, absolutely, to disqualify any entrant who submits an entry that the Promoter considers is not in accordance with these Terms and Conditions, including where an entry is inconsistent with Quit Victoria messages as set out on the Quit Victoria website. a)	During the promotional period, submit a story entry via the Quit website detailing their quitting experience. 10. If a prize is not available at the date the prize winners are announced, the Promoter reserves the right to substitute the stated prize with a prize of comparable value. 11. Winners will be notified via email and the Quit Victoria Facebook page within three days of the judging date, specified above. 12. Incomplete or indecipherable entries will be deemed invalid. 13. One entry is permitted per entrant, in accordance with entry requirements. 14. If there is a dispute as to the identity of an entrant, the Promoter reserves the right, in its sole discretion, to request and obtain proof of the identity of the entrant. 15. 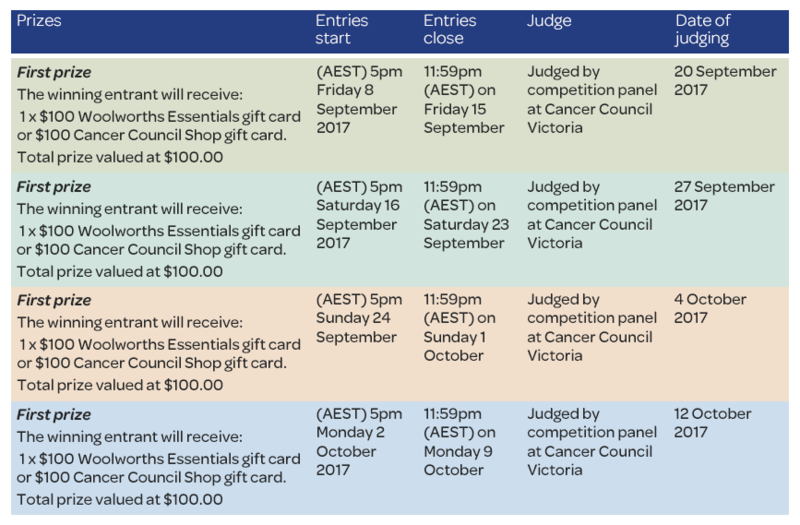 This is a game of skill, and entries will be judged by the competition panel at Cancer Council Victoria. Chance plays no part in determining the winners, and all entries that are not otherwise excluded from consideration under these terms will be judged. 17. The judges may select additional reserve entries which they determine to be the next best, and record them in order, in case of an invalid entry or ineligible entrant. 18. The Promoter’s decision is final and no correspondence will be entered into. 19. Winners will be required to provide their contact details to Quit Victoria for delivery of their prize. If, for any reason, a winner does not contact Quit Victoria to claim their prize by 5pm on the 20th September 2017, 27th September 2017, 4th October 2017 and 12th October 2017 then the prize will be allocated to the next best entrant as assessed by the judging panel. 20. If any prize (or part of any prize) is unavailable for any reason, the Promoter, in its absolute discretion, reserves the right to substitute the prize (or that part of the prize) with a prize to the equal value and/or specification. 21. Prizes, or any unused portion of a prize, are not transferable or exchangeable and cannot be taken as cash. On-selling of prizes is not permitted. 22. When an entrant submits any materials via the Promotion including comments, photos and images (“Content”), intellectual property subsisting in the Content vests in the Promoter and the Promoter may use, reproduce, modify, adapt, publish and display such Content for any purpose in any media, without compensation, restriction on use, attribution or liability. Entrants agree not to assert any moral rights in relation to such use and warrant that they have the full authority to grant these rights. e)	they will comply with all applicable laws and regulations, including without limitation, those governing copyright, content, defamation, privacy, publicity and the access or use of others' computer or communication systems in Australia. 24. The Promoter may remove any Content without notice for any reason whatsoever, including where content is objectionable in the ways described in sub para 21(a) above. 25. Entrants consent to the Promoter using their name, likeness, image and/or voice in the event they are a winner/s (including photograph, film and/or recording of the same) in any media for a period of 12 months from Friday 15 September 2017, without remuneration, for the purpose of promoting this promotion (including any outcome), and promoting any products manufactured, distributed and/or supplied by the Promoter. 26. If this promotion is interfered with in any way or is not capable of being conducted as reasonably anticipated due to any reason beyond the reasonable control of the Promoter, including but not limited to technical difficulties, unauthorised intervention or fraud, the Promoter reserves the right, in its sole discretion, to modify, suspend, terminate or cancel the promotion. Notice of cancellation will be communicated via the Quit Facebook page. 27. Any cost associated with accessing the promotional website is the entrant’s responsibility and is dependent on the Internet service provider used. The use of any automated entry software or any other mechanical or electronic means that allows an entrant to automatically enter repeatedly is prohibited and will render all entries submitted by that entrant invalid. 28. Without limiting any other terms herein, the entrant agrees to indemnify the Promoter in respect of any loss incurred as a result of the entrant’s breach of any of the above terms. d)	any damage to persons or property, including to the participant's or any other person's computer related to, or resulting from, participation or downloading any materials in this competition. e)	Injury or loss sustained to any persons or property in the course of participating in any activity won as a prize. 30. Failure by the Promoter to enforce any of its rights at any stage does not constitute a waiver of those rights.